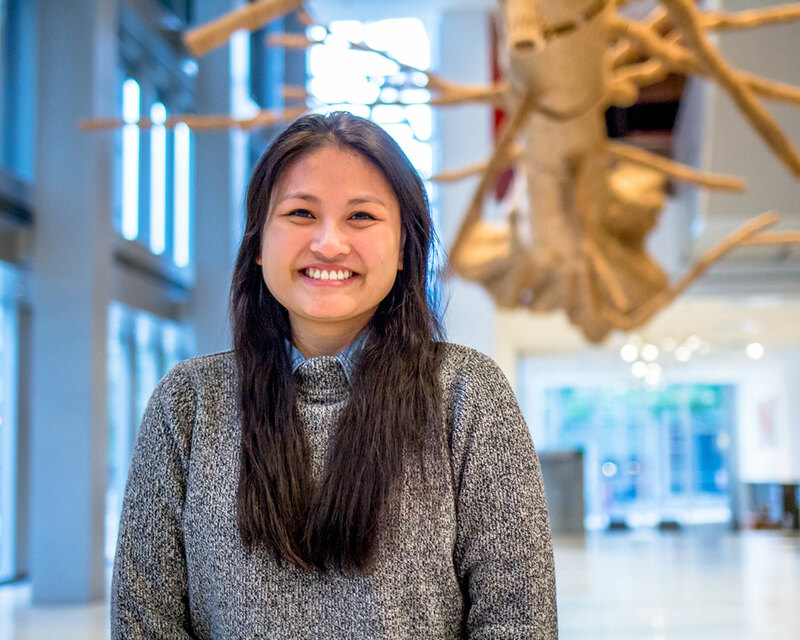 SAM’s ongoing Emerging Arts Leader Internship continues this winter with Trang Tran, a senior at the University of Washington. 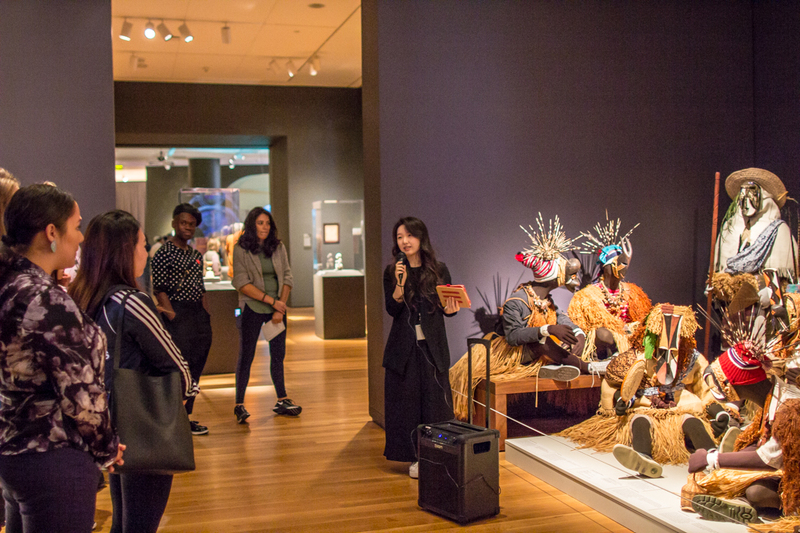 This paid internship is aimed at candidates who are underrepresented in the museum field. 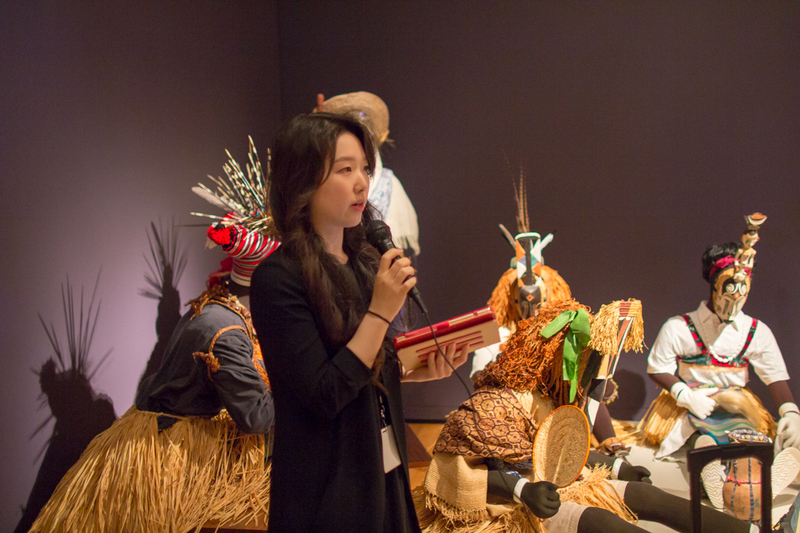 It’s an interdisciplinary internship that allows the intern to interact with diverse aspects of museum work and contribute their unique insights and perspectives. Members of SAM’s Equity Team, representing several departments at the museum, make up the hiring committee for this important internship that is just one way SAM is working to create points of entry into the museum field and work toward equity and inclusion within our own walls. Launched in 2016, the internship program now boasts seven graduates. Save the date for Thursday, December 6! 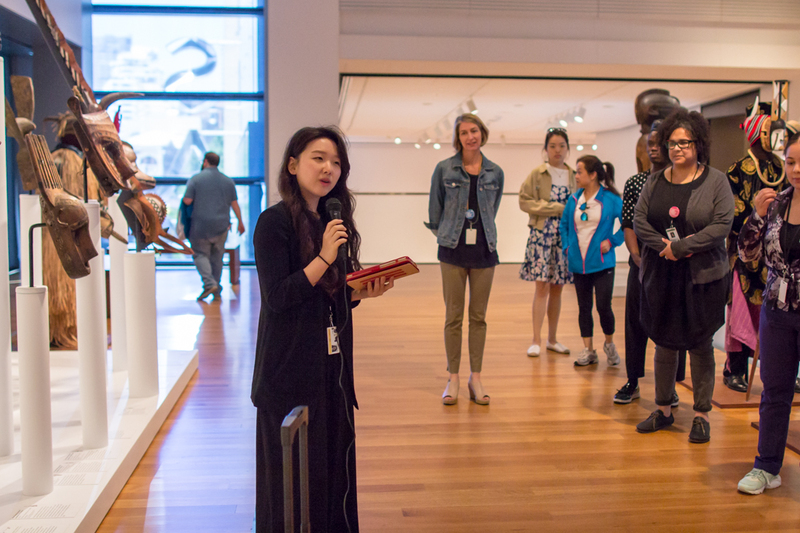 Trang will lead a free My Favorite Things Tour in the galleries focusing on some of what she’s learned while contributing to SAM. You won’t want to miss it. We asked Trang: What’s a work of art that challenged your perspective on life? When I reflect on the past 10 weeks of my internship, I imagine having one of those View-Masters (they’re still relevant, right?) and clicking through reels of moments at SAM. It starts with the welcoming faces of everyone I meet coming into view. Then, a whirlwind of back-to-back meetings; getting lost in the labyrinth of the administrative office; storage visits with Carrie (thank you, Carrie! ); always pressing the wrong level in the elevator; researching objects; conducting informational interviews with staff; preparing for my My Favorite Things tour; taking part in Career Day, Seattle Art Fair, Summer at SAM, and Remix; and so much more. As if in slow motion, images of my last week include the nerve-wracking day of my tour and saying goodbye to everyone I had the privilege of working with. I’m surprised how much I changed in this short time span. In the beginning, I thought I knew enough about diversity and equity work from courses at university and my past experiences that I was only focused on giving my perspectives rather than allowing myself to be vulnerable and molded by those far more experienced than I. Working closely with the equity team this past summer, I found myself constantly learning, practicing, and honing the use of an equity lens in my work. I experienced the behind-the-scenes of a museum and community working towards transparency and racial and social equity. I saw every meeting ask how to be inclusive, provide access, and advance equity. There was, and is, so much I don’t know, not only regarding the arts and museums, but also in becoming a better ally for community. Watching and working alongside these amazing and passionate individuals, I’ve come to reevaluate myself, my goals, and my passions on a weekly basis. What resulted of this reevaluation was the “My Favorite Things” tour I had the privilege of leading (I still can’t believe I led a tour). To close off, I’d like to share a snippet from what I shared at the tour. To everyone I met and worked with this past summer, thank you so much for your continuous kindness, encouragement, and acceptance. I’ve never felt more welcome and cherished in a workplace setting than at SAM. And, thank you for all you do on a daily basis to work for and better our community. Katie Morris is a graduate intern at the Seattle Art Museum, working with the Curatorial Division this fall. This week, she gave a thoughtful and insightful tour of five of her favorite objects to SAM staff and interns. Here, she shares her thoughts with you. Having been asked to choose my five favorite pieces of art on display at SAM I must apologize because I have come to the conclusion that I simply cannot achieve this goal. For me, it is impossible. Not only did I find that choosing five objects above all others on my preliminary “list of favorites” too difficult, in the process of attempting to fine-tune my selection I would inevitably find another intriguing or beautiful object that captured my eye with every walk through the gallery space. And don’t get me started on what a new day and different mood did to my selection. So, with defeat not an option I tried to look at the task from a different angle, to give myself some boundaries and to try and anchor my selections. With this in mind a very large theme began to emerge across many of the objects at SAM – the theme of Ceremony. In its most basic sense, ceremony is defined as a ritual observance and procedure performed at grand or formal occasions. In many regards, ceremony is apart of our daily lives. Canoe-shaped bowl with quail topknots, early 20th century, Native American, Californian, Pomo, willow, sedge root, bracken fern root, quail feathers, 1 3/4 × 6 1/4 × 2 1/4in., Gift of the Estate of Robert M. Shields, 2013.4.13. Currently on view in the Native American art galleries, Seattle Art Museum. This canoe-shaped bowl with quail topknots is a quiet symbol of ceremony. For Native American Indians of the American West, basketry and weaving is considered a highly skilled art form passed down between generations. 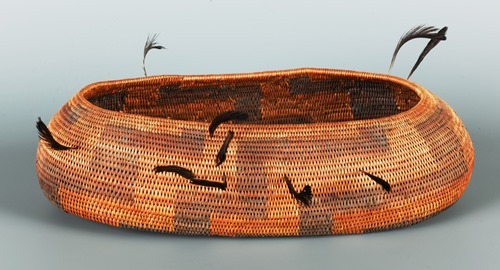 A woven object not only usually serves a direct and functional purpose, but it is also indicative of a broader system of cultural knowledge in its design, technique and the materials available locally for its creation. 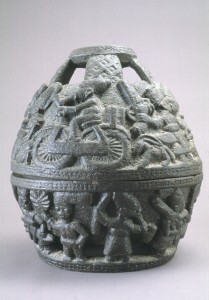 Baskets such as this one were made as simple containers, but also as gifts during formal occasions. For example, traditional wedding ceremonies in certain regions often included the bride and groom gifting each other baskets full of objects signifying commitment; for women, bread and corn to symbolize the lifetime of support she will share with her new husband, for men, meat and skins for his bride to represent his promise to feed and clothe her. Baskets in other clans were used during birthing ceremonies, holding the baby’s umbilical cord along with other objects of meaning so that the ancestors will recognize them when they arrive in the spirit world. Lkaayaak yeil s’aaxw (Box of Daylight Raven Hat), ca. 1850, Native American, Tlingit, Taku, Gaanax’adi clan, maple, mirror, abalone shell, bird skin, paint, sea lion whiskers, copper, leather, Flicker feathers, 11 7/8 x 7 3/4 x 12 1/4in., Gift of John H. Hauberg, 91.1.124. Currently on view in the Native American art galleries, Seattle Art Museum. This carving of maple, mirror, abalone shell, bird skin, sea lion whiskers, copper, leather and Flicker feathers is an elaborate example of Tlingit carved wood hats. 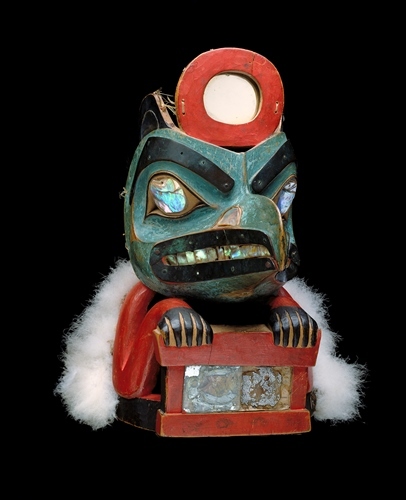 These carvings, attached to larger headdresses, are among the most significant objects of Tlingit clans, kept safe by the clan leader or caretaker. 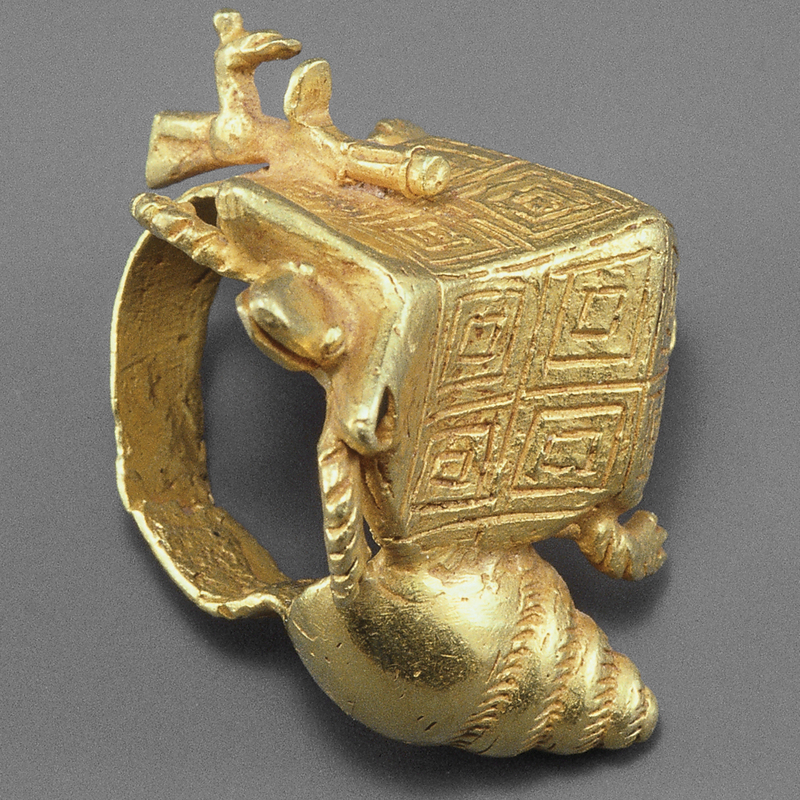 They are shown or worn only on ceremonial occasions and their carving often captures distinct geographic features, animals or natural phenomena that form part of the clan’s legends to which it belongs. This carved wood hat depicts Raven with human-like hands and fingers. Tlingit legend says that Raven was responsible for organizing the world to the form that we inhabit it today – this carving shows him releasing the sun, the red disk above his head, and the stars and moon which are in the box that he holds. It is unusual in its full sculptural form of Raven, who is frequently depicted in the face only. Pukamani pole, 1999, Leon Puruntatamari, Australian Aboriginal, Tiwi Islands, Melville Island, born 1949, natural pigments with fixative on ironwood, height 104 5/16in., Partial and promised gift of Margaret Levi and Robert Kaplan, in honor of the 75th Anniversary of the Seattle Art Museum, 2005.155, © Leon Puruntatamari. Currently on view in the Australian Aboriginal art gallery, Seattle Art Museum. 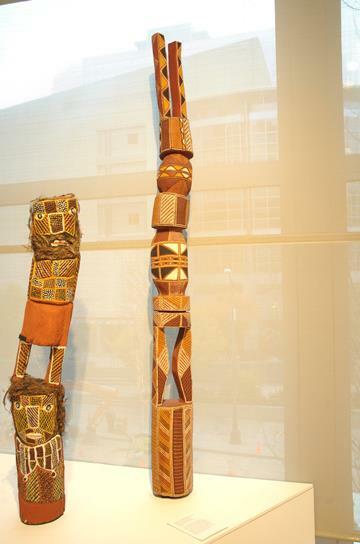 This ironwood Pukamani pole is another example of carving used in ceremony. For the Tiwi people of the Tiwi Islands, just off the coast of the Northern Territory in Australia, Pukamani is the ceremony surrounding death. It is performed over a series of rituals beginning with the burial of the body and culminating in the final ceremony where carved Pukamani poles are placed around the grave in a circular shape to contain and comfort the spirit of the deceased. Between death and the final placement of burial poles around the grave sometimes more than a year will pass, but most often about six months, as the family of the deceased work to organize the people who will be involved in the ceremonial duties. It also takes a long time to carve and paint a Pukamani pole. 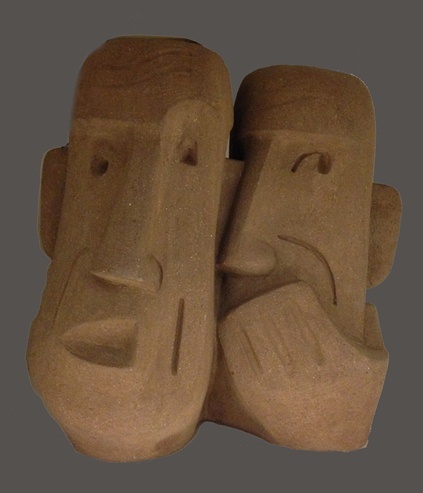 The artists of Pukamani poles such as Leon Puruntatamari, who made this example, are paid for their artistic efforts as whilst it is a privilege to be commissioned to complete a burial pole, the deceased’s honor is attached with how his or her family arranges the Pukamani ceremonies and how generous they are with those participating. At a Pukamani ceremony members of different Tiwi clans congregate to ensure the safe and happy journey of the deceased to the spirit world through dance and song. People will paint their bodies with designs not foremost to designate clan as is usually thought to be the case, but rather to disguise the body from the deceased who is considered to be in trickster mode until the completion of Pukamani rituals. Tiwi people will also wear feather armbands and headdresses in order to better disguise themselves. Katie Morris, looking at paintings by Emily Kngwarreye, promised gifts of Margaret Levi and Robert Kaplan, all paintings © Emily Kngwarreye. 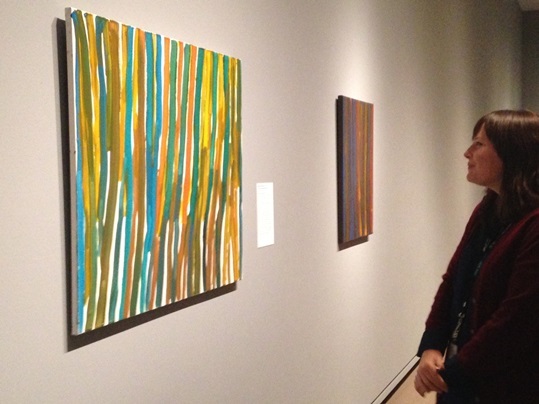 Currently on view in the Australian Aboriginal art gallery, Seattle Art Museum. Although there are thousands of miles between the Tiwi Islands and Emily Kngwarreye’s Country Alhalkere, in Australia’s Utopia region of the central Desert, the act of body painting during and for ceremony is of equal and sacred importance. Emily Kngwarreye starting painting on canvas in 1989 and before her death in 1996 she completed close to 3000 works. Posthumously she has been celebrated as a great abstract painter, contributing to the same artistic dialogue as artists such as Jackson Pollock and Willem de Kooning. But Emily Kngwarreye never saw one of these iconic artist’s work, let alone studied them in a book. For Emily, her work considered and was about one subject only: her Country. In Awelye (Ceremony), we are seeing the same lines on the canvas as they traditionally appear on the body during women’s ceremonies. With this in mind, the surface of the painting can be likened to a ceremonial ground in which Emily Kngwarreye reenacted the ceremony to which she was custodian. She was known to sing as she painted, using the canvas to remember and pay homage to her Country. With each brushstroke she connected herself to her ancestors and kin. Tureen, ca. 1725-30, Austrian, Du Paquier manufactory, hard paste porcelain, 7 3/4 x 8 1/8 x 14in. 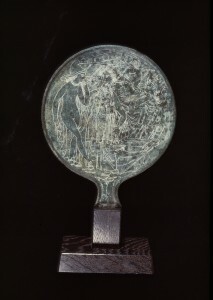 overall, Gift of Martha and Henry Isaacson, 69.171. Currently on view in the Porcelain Room, Seattle Art Museum. With family in mind, my final object of ceremony is of a vastly different tone to my four previous choices. It is in no way intended to trivialize the extreme significance of the four preceding examples of objects I have presented which are tied to ceremony, but rather to simply present another object from a new angle. Given the time of year and the busy Holiday season approaching, I cannot help but reflect on the ceremonies that I know I will be apart of in the last months of the year. 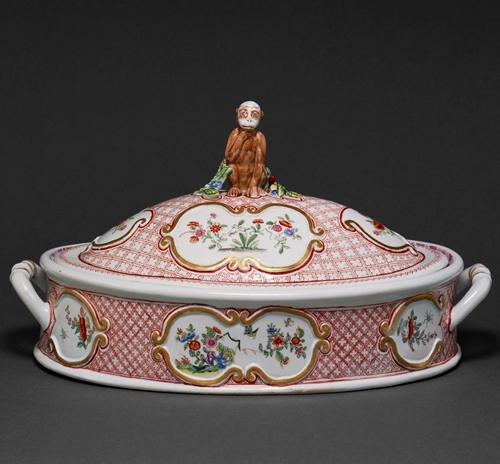 This hard paste porcelain tureen was produced in Vienna sometime between 1725 and 1730. The many treasures that made their way back to Europe as a result of increased trade in the eighteenth century influenced its design. You can see the lure of exotic and distant lands that came about with this travel is visible in the monkey and Japanese-inspired floral decoration. When looking at this quirky object of domesticity I find myself wondering of the tables that this tureen has graced and the conversations it has overheard. Has it been apart of a wedding or a birthday celebration? Or perhaps a meal on a religious holiday? After all, what is the act of sitting around a dining table during the holidays or a special occasion with family and friends? Whether your holiday meals involve an elegant monkey tureen or paper plates and takeaway containers, I suggest that it is all ceremony. This summer, intern Sholeh Hajmiragha has been working with me on two projects. Her first project was to sift through years of accumulated notes on SAM’s maiolica collection, and update our records according to the best and most recent information. Her second project was different. She tells you more, below. In the last three weeks of my curatorial internship at the Seattle Art Museum, I was given a project – to imagine that I had the power and the unlimited funding to acquire any and all art from contemporary artists in the Middle East. This exercise was consuming and exciting, and it allowed me to gain a much greater insight into the acquisition process and research required in acquiring art. On this last day of my internship, and for my farewell blogpost, I’ve decided to share one of my favorite artists that I researched during this exercise – ninety-eight year old Saloua Raouda Choucair. Saloua Raouda Choucair represents an oversight in the western conception of contemporary art history. Born in Beirut in 1916, Choucair is heralded as a pioneer of abstract art in the Arab world, though until recently Choucair was largely unknown outside of Lebanon. Now in her ninety-eighth year, Choucair’s most recent exhibition at Tate Modern in 2013 was the first time her work has been shown publicly on a global scale. In this regard, Choucair’s work can be considered new, with herself an unknown artist. Yet, what makes her work significant is the reality that Choucair has been working as a female artist in the Beirut art scene from the 1940s, studying in the studio of Fernand Léger in Paris, and producing abstract art alongside the historical western modernist art movement. Maymanah Farah writes in her essay “Saloua Raouda Choucair: Reinventing Abstraction”, “One of the many myths of the Western canon is that European modern artists invented abstraction…At the moment, there is a multidisciplinary campaign to correct the shortcomings of this history of Modernism by looking past the borders of Euro-American art centers. It is within the experiments of artists who are noticeably absent from the Western view of art history, despite having been in pursuit of modern aesthetics, that examples of pre-modern abstraction are beginning to be reevaluated.” Choucair’s work is a perfect example of this as her abstract, modern forms and figures reflect both modernism aesthetics as well as historical Islamic art forms. Choucair’s art encompasses the intersections of time, space, and place. Though existing in the artistic school of western modernism, Choucair’s abstraction is distinct and notable. 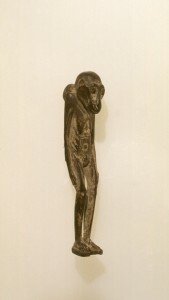 As Samir Sayigh writes, “this abstraction, despite its proximity to that characterized by modern art in the great artistic capitals of the world, and despite its singularity in Lebanon and the Arab nation, remained an abstraction converging with the contemporary characteristics which characterize Eastern art, and more specifically Arab Islamic art, much more than with Western abstraction as perceived by Kandisnsky, presented by Mondrian, and realized in the Bauhaus Collection.” In addition to this dialogue of east and west lies another relationship of the object and space. Not only does Choucair manipulate her paintings to reflect depth and form, but her three-dimensional sculptures present not only an abstraction of architecture and space and the manipulation of shape and form, but also bridge the divide between language and text and art and space. 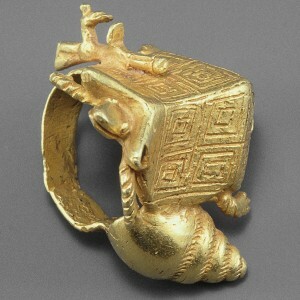 Choucairs complex, interlocking sculptures are a clear example of this. Choucair creates sculptural poetry that is constructed through various building blocks and carefully molded shapes that fit together and connect, creating a larger holistic form. As Choucair has stated, “The way I organized my sculptural poems, for example, was inspired by Arabic poetry. I wanted rhythm like the poetic meter, to be at once more independent and interlinked, and to have lines like meanings, but plastic meanings.” In this manner, Choucair translates the very deeply rooted Arabic cultural tradition of poetry into a modern and abstract art form that physically embodies a simultaneous interlocked dependence with a detached and separable independence. For me, reading about and researching Choucair and her art was both inspiring and incredibly humbling. The vast amount of work that she produced over her extensive life, with little to no recognition beyond her local art scene, is really profound. This exercise in acquisition research highlighted for me the power and significance of displaying and curating art. The power of her work lies not only in the art itself, but in the fact that it is now able to be seen and appreciated, showing not only her artistic achievements, but also her own life history. Maymanah Farahat, “Saloua Raouda Choucair: Reinventing Abstraction”, Saloua Raouda Choucair, ed. Jessica Morgan (London: Tate Publishing, 2013), http://www.jadaliyya.com/pages/index/14828/saloua-raouda-choucair_reinventing-abstraction-. Samir Sayigh, trans. Anna Swank, “Saloua Raouda Choucair: Distinctiveness of Style and Individuality of Vision”, ArteEast (2008), <http://www.arteeast.org/2012/03/04/saloua-raouda-choucair-distinctiveness-of-style-and-individuality-of-vision/>. Quoted in Mulhaq al-Nahar, 23 September 1995, p. 10, as recorded in Tate Modern summary of Poem (1963-5): <http://www.tate.org.uk/art/artworks/choucair-poem-t13278/text-summary>. Kevin Jones, “Memory, Corrected: Saloua Raouda Choucair”, ArtAsiaPacific, Issue 88, May/June 2014, <http://artasiapacific.com/Magazine/88/MemoryCorrected>. 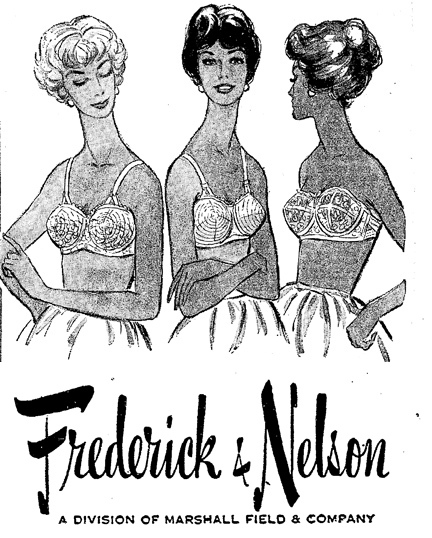 Let’s face it: women were not exactly free to challenge the system in the 1950s. Donna Reed was the ultimate hero for women of that decade; the perfect example of what a housewife and mother should be. Other examples of these women are found in the Seattle Times’ historic archives, where engagement announcements, sorority fundraisers, and art show reviews mix and mingle on the society pages. 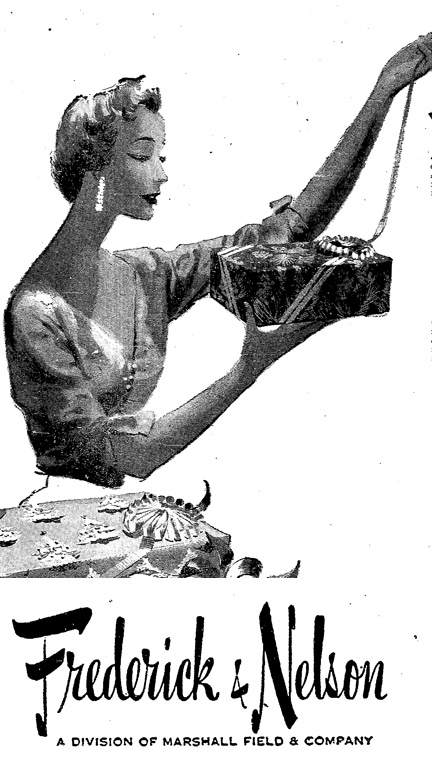 Advertisements proudly display the latest fashions and gadgets that can help the average housewife “wow” her family and friends with her ability to clean the house, cook a full meal, and still look like she just stepped out of a magazine (note: this usually involved a girdle). This decade has been picked apart in retrospect by television and film, but not many have explored the art and history of this time period better than Mona Lisa Smile. Katherine Watson (Julia Roberts), an art history professor at Wellesley College in 1953, challenges her female students by asking them to reconsider everything they’ve ever been told about “the roles they were born to fill.”  Katherine Watson pushes them to think beyond marriage and the expectations of the time. It is revealed in the film that Katherine’s mother was a part of the war effort and her independence from this time translated onto her daughter. 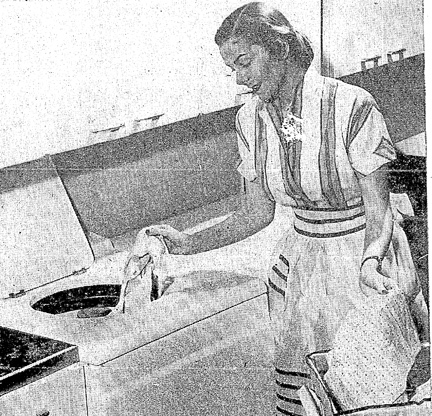 Many women of the 1950s were influenced by World War II and the aftermath of it that changed America and the way people thought about gender roles in society. Women had been given a chance to be independent and made up a large portion of America’s work force while they held down the home front. However, much of this changed when the war ended and men returned from overseas. But what does this have to do with the Seattle Art Museum and the artists that we have in our collection? A lot. Many of the female artists I have been researching over the last year worked in this decade and had difficulty breaking the barriers that society had created. Katherine Watson is a prime (Hollywood) example of what female artists were trying to do in the 1950s. However, we have two artists that are a little closer to home for us that were able to create a name for themselves. Ebba Rapp and Jean Cory Beall were both born in 1909 and were highly accomplished and well known in the art community. Jean Cory Beall grew up drawing and painting and took this passion with her into higher education in Paris, Mexico, and Seattle. Her watercolors and mosaics were primarily created for private clients but she also began receiving public commissions for mosaic murals. Beall’s work was quickly recognized as something special and led her to accomplish an extraordinary amount, especially for a woman living and working in 1950s America. However, her career wasn’t easy to build. Beall created her own art and assisted her husband with design sketches for some of his Boeing products, while also taking care of their three children, Alan, Corey, and Barbara. Beall seemed to “do it all,” and was recognized many years by the Seattle Art Museum’s Annual Exhibition of Northwest Artists, winning an honorable mention in 1943 for her piece, “Boomtown.” Her work continues to hang in various museums and public buildings across the country, including the Federal Reserve Bank, the General Administration Building (Olympia, WA) and the Erco/Co. in Washington D.C. Originally a painter like Beall, Ebba Rapp was an accomplished portrait artist by the time she reached high school, but in the 1930s she had an opportunity to study under the renowned sculptor, Alexander Archipenko. 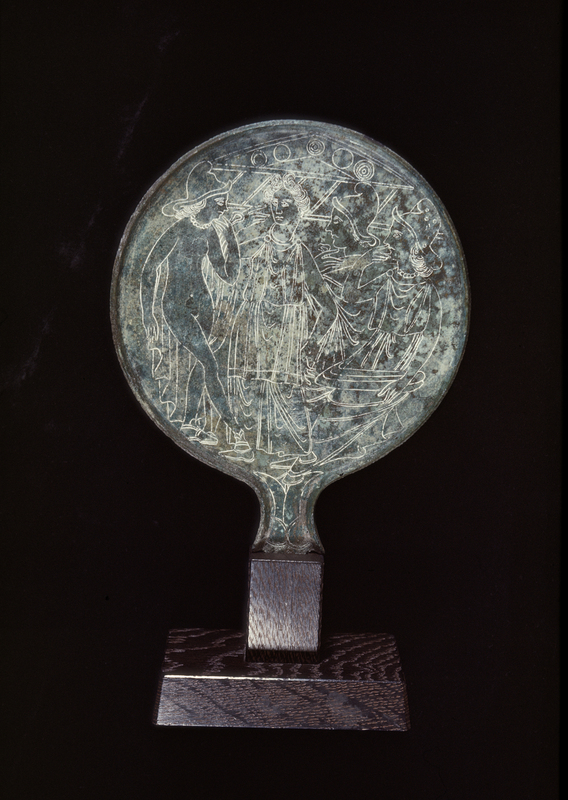 She began to incorporate sculpture into her work and her talent was eventually noticed outside of her local community when one of her pieces was included in the American Art Today exhibition at the New York World’s Fair in 1939. Rapp was also an active member of the Women Painters of Washington, founded in 1935. Rapp joined this group of women in 1936 after commenting that the Seattle art community was “dominated and politically controlled by a clique” of men, and that women were “systematically excluded.” The Women Painters of Washington came together to “overcome the limitations they faced as women artists and to realize their artistic potential through fellowship.” This community was needed at a time when women were not afforded the resources and recognition that they wanted or deserved and it continues to support women and their artwork today. Rapp, like Beall, had very a supportive husband who pushed her to share her work with the community. Rapp was incredibly humble; she often “turned commission invitations to others and was reluctant to enter her work in exhibitions.” Oftentimes her husband, John D. McLauchlan would enter work to shows on her behalf. A Seattle Times reporter noted in 1959, that Beall’s husband, Wellwood E. Beall, was “a person who believe[d] in letting wives have careers.” This was out of the ordinary for the time; a husband who supported his wife having a career instead of a hobby? Ludicrous! Both Mr. McLauchlan and Mr. Beall broke the mold of a 1950s husband by encouraging their wives to follow their passions. Among other things, the opinions of men are something that Katherine Watson tries hard to counter in Mona Lisa Smile. Topher Grace’s character, Tommy, says it would be hard for his fiancée, Joan (Julia Stiles) to commute to and from law school and still get dinner on the table by five. These were the expectations that many held during that period. Finally, Katherine gets through to one of the girls. Betty Warren (Kirsten Dunst) was Katherine Watson’s most staunch opponent, but by the end of the film she understands that even though Mona Lisa is smiling in Leonardo’s masterpiece, we do not know if she was actually happy. Like so many women of the time, Betty Warren wore a mask and pretended she was happy because she was doing what she was told she should be doing. Jean Cory Beall and Ebba Rapp may not have had easy journeys to begin their creative careers, but they proved that they could support their husbands and families while also breaking those social mores and being successful and driven women who opened the doors for generations of artists to come. Mona Lisa Smile. Revolution Studios and Columbia Pictures, Inc., California, USA, 2003. Fitzgerald, Annamary. “National Register of Historic Places Registration Form: General Administration Building,” United State Department of the Interior, National Park Service, July 1, 2006, p. 8. “1994 Distinguished Engineering Alumni/ae Award Recipients,” The University of Colorado, 1994. “Newcomers Win Prizes in Art Preview,” The Seattle Times, October 7, 1943, p. 26. “Assembly Names Five As Leaders in Fine Arts,” The Seattle Post Intelligencer, November 4, 1958, p. 12. John McLauchlan. Interview by Barbara Johns. Tape recording. Seattle, WA., 26 February, 1987. “Mexican Muralist is Teacher,” The Seattle Times, August 23, 1959. Archives and exhibitions intern Kaley Ellis joins us again to talk about her discoveries in SAM’s archival holdings. This month, after an impressive 37 years working at SAM, Julie Emerson, the Ruth J. Nutt Curator of Decorative Arts, is retiring. In recognition of Julie and her career, I am writing this blog entry on an exhibition that featured decorative arts. I am currently cataloguing the exhibition Worcester Porcelain: The Klepser Collection, which ran from August to September of 1985, and featured works that remain in SAM’s collection today. 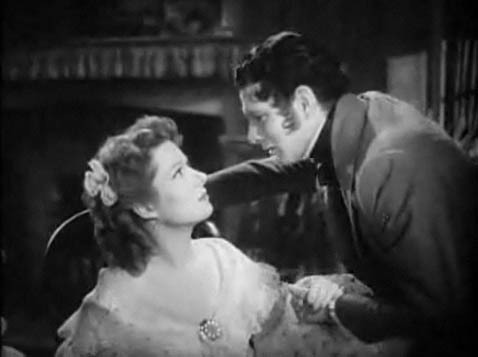 Upon researching Worcester Porcelain, I was immediately drawn to the film screenings – highlighted in the 1985 Member’s Preview brochure – that were shown throughout the duration of the exhibition, including Tom Jones, Barry Lyndon, That Hamilton Woman, and Pride and Prejudice (the romantic black and white – but slightly less accurate – version, for those of you who know your Austen multimedia). Laurence Olivier plays the dashing hero in both That Hamilton Woman and Pride and Prejudice, and while he is the war hero in That Hamilton Woman – including missing limb and roguish eye patch – I remain drawn most strongly to his portrayal of Mr. Darcy (shocking, I know, but it’s hard to beat his reluctant fall for Ms. Elizabeth Bennet, played by the timeless beauty Greer Garson). 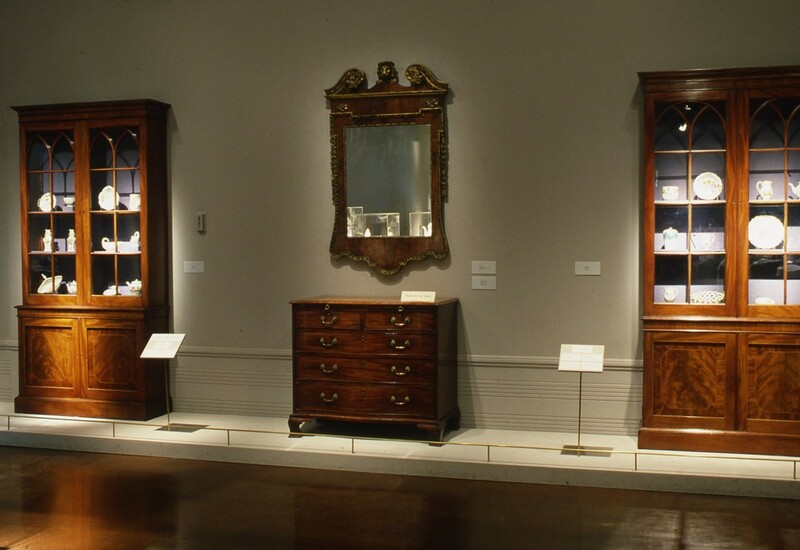 These romanticized depictions of 18th century England (excluding, of course the rather depressing tale of Barry Lyndon’s misfortunes) offer their viewers a look at both the time period and the grand estates where these porcelain objects would have been found. 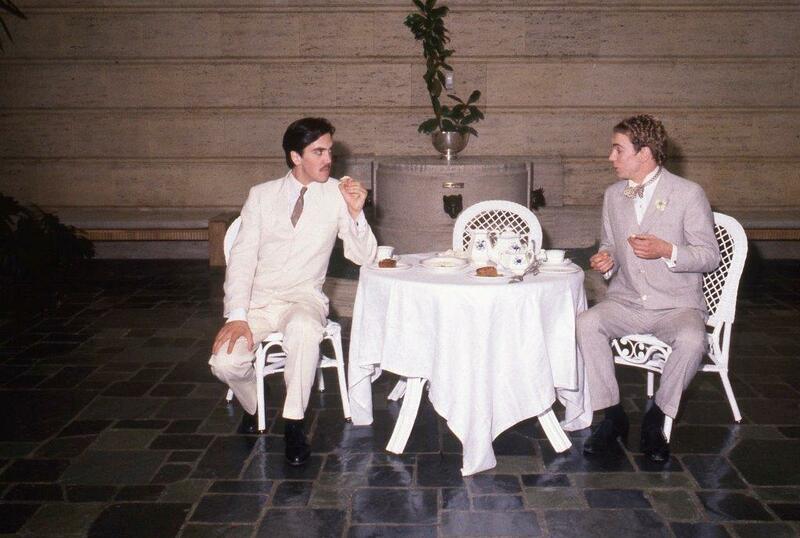 And if these classic films weren’t enough to lure visitors to the exhibition, there was also the promise of a reenactment of the tea scene from Oscar Wilde’s The Importance of Being Earnest (a delightfully witty play – later made into a movie starring Reese Witherspoon, Rupert Everett, and Colin Firth, who also played Mr. Darcy in the most famous version of Pride and Prejudice). Here, the actors demonstrate the tea ceremony, a tradition in 18th century England in which a proper tea set was required – according to the exhibition catalogue – containing 48 pieces plus the additional eight mugs required for sipping chocolate (a necessary addition, in my opinion). 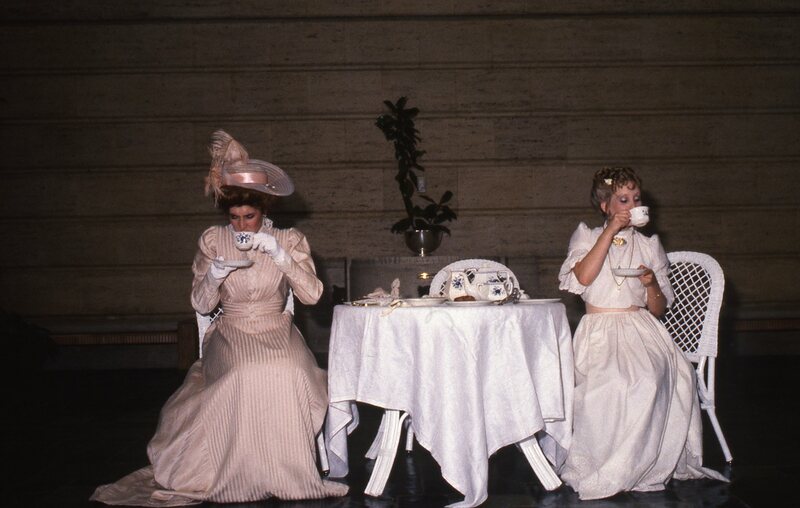 Tea scenes from The Importance of Being Earnest. Performed on August 11th 1985 at Volunteer Park. 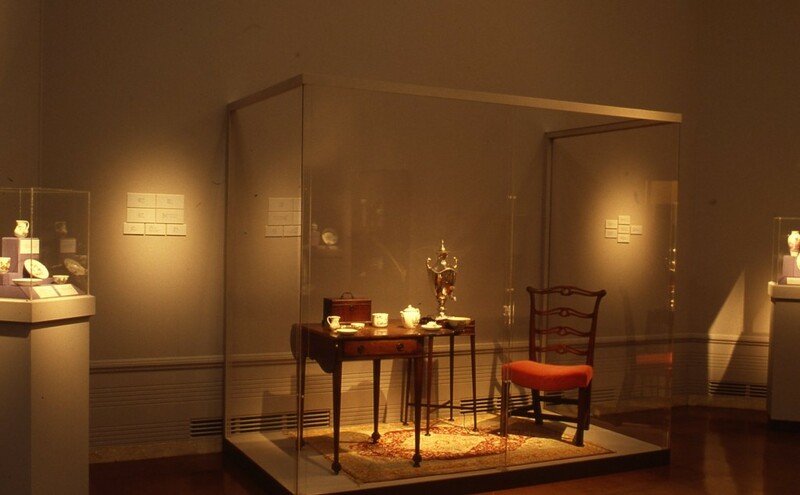 Although these films do not specifically reference 18th century English porcelain, they offer the viewer a glimpse at what would have been their natural setting, in which these objects would have served both an aesthetic and functional purpose. The elegant, romantic, vividly colored, and often Asian-influenced designs of the Worcester porcelain objects hint at the type of lifestyle found on the elaborate English estates during that period – one of luxury and everyday grandeur. In many cases the exhibition space for Worcester Porcelain: The Klepser Collection reflected the dual role of these art works – their functional role as serve ware arranged on elegant tables and their decorative role that shows them displayed in large wall cabinets or featured in individual cases that highlight their artistic value. The production of Worcester porcelain is separated into three main categories based on the period it was created, between the years 1751 and 1776. The first period (1750-55) saw the manufacturing location for porcelain shift from Bristol to Worcester. This period emphasized rococo styled European-scenes (think Fragonard and Boucher) in addition to oriental decorative influences (specifically Chinese – a result of Chinese porcelain that was being imported during the 17th and 18th centuries to England) seen in the graceful landscapes, floral varieties, long flowing robes worn by the central figures, and the animals portrayed. One example from this period can be found at SAM (seen below). 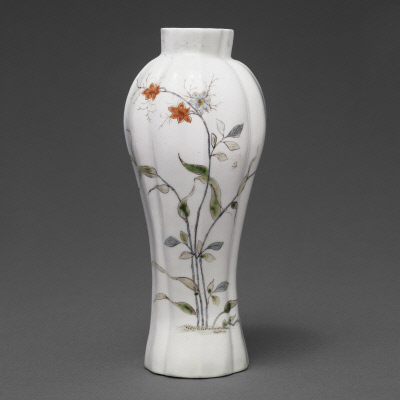 The floral decorative pattern and color usage on this vase reflect the stylistic impact that Chinese arts had on the European porcelain market. The second phase of production (1755-65) saw hand-painted designs replaced by a new technique called overglaze transfer-printing, which allowed these luxury goods to be produced at a faster rate and resulted in a period of rapid growth in the porcelain business. 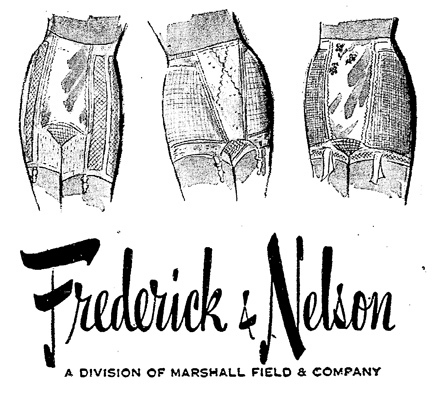 The use of this technique – in which patterns and designs become standardized – allowed these pieces to be reproduced quickly and more economically. Furthermore, the sturdy quality of the glaze made it possible for it to hold boiling water without cracking unlike other porcelain products of the time, creating a significant advantage over their competition. Finally, the period from 1765-76, appears to have been one of the most lucrative periods, in which the decorative aspects are increasingly praised, blue underglaze transfer-printing reaches its pinnacle, and color grounds are mastered (Worcester now has the largest array of colors in England, including yellow, green, pink, purple, several shades of blue, and red). In the end, Kenneth Klepser – Seattle businessman and owner of this impressive collection – viewed these works of art in much the same way as their original owners in 18th century England, as something to be cherished and integrated into his home. 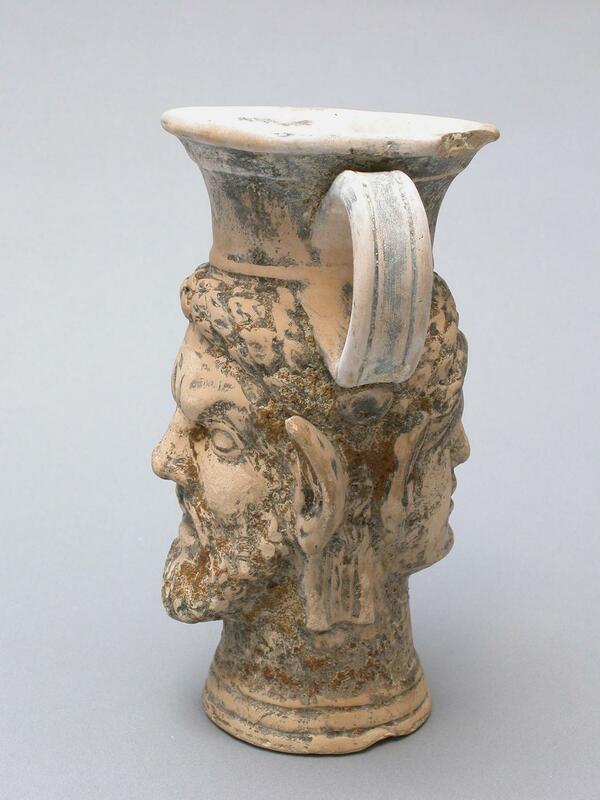 These objects act simultaneously as works of art as well as pieces of functional history, creating a more complete picture of the historical setting from which they originated. 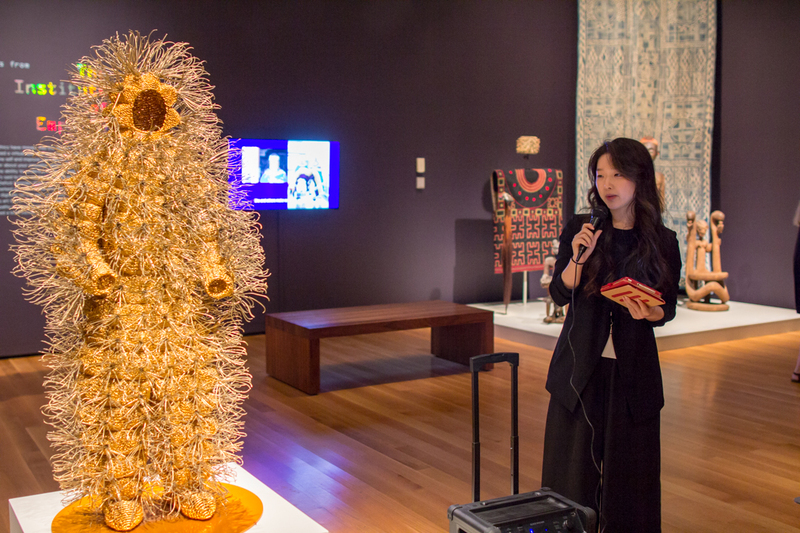 The combination of the exhibition’s installation space – which highlighted the dual function of these objects – and the events associated with the exhibition provided a successful lens through which audiences could view these art works. However, viewers don’t dismay! While this exhibition is no longer on view, the Seattle Art Museum has a gallery (curated by Julie Emerson) that is dedicated solely to porcelain! This rather splendid room – organized by color and theme – accentuates the intricate patterns and Asian-influences comparable to those highlighted in the Worcester Porcelain exhibition and offers contemporary viewers a chance to see these elegant styles favored by Europeans during the 17th and 18th centuries. Come visit, and see if you can find all the porcelain objects from the Kenneth and Priscilla Klepser Porcelain Collection. See Julie Emerson’s guide to SAM’s Porcelain Room here. As an intern in the Curatorial Department at the Seattle Art Museum, I have spent much of the last year researching and writing about Northwest artists, all of whom experienced World War II in some way. It has been an interesting project to learn about people who allow me to look at this era from different and very personal points of views. World War II was a monumental event for the whole world. It reached into every community and every household, becoming the single most written-about event in history. 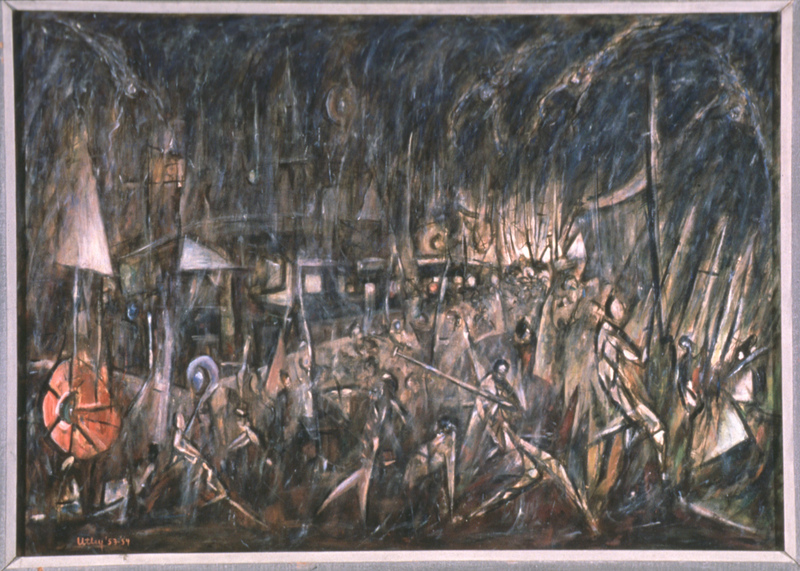 The three artists who are highlighted in this post all have connections to the Pacific Northwest, the Seattle Art Museum, and World War II. While each of them has a distinct story from this time, their shared identities of being artists consumed by war bring them together in a unique way; they each contributed to the wider war effort, both at home and abroad while furthering their artistic talents. Juanita Vitousek was a mother in Hawai’i when bombs fell on Pearl Harbor in 1941. A watercolor artist, already known both in Hawai’i and in the continental United States, she had lived in Hawai’i for twenty-four years before the war. During World War II, Juanita wrote a daily account of life on the Island during and after the attack on Pearl Harbor. She originally kept her wartime journal so she could send it to her children on the mainland when mail was once again able to flow freely without censorship. She opened her diary with: “We can’t phone, cable or even write you. I want you to know all about us, so I will write a daily account of what has happened. Some day you will see it.” She contributed to the war effort by donating blood and volunteering to make camouflage nets for troops. Her husband, Roy Vitousek Sr, also made history as “the first American plane engaged in combat during World War II.” An amateur pilot, he was out for a flying lesson with their son, Martin, when the Japanese began to attack Pearl Harbor. He was able to land the plane amid Japanese fire and hide with his son in nearby bushes. Windsor Utley was more removed from the action because of his objection to violence and war. He was classified as a conscientious objector during World War II. He believed in the Baha’i faith, which continues to spread ideas and practices of peace in the world today. Utley was one of 12,000 conscientious objectors in the United States, who were required to perform free labor around the country in lieu of serving in the armed forces. The Civilian Public Service (CPS) program allowed these men to avoid conflict but still contribute to the war effort. Men in 152 camps worked in soil conservation, forestry, firefighting, agriculture, social services and mental and public health instead of going to war. Some also served as test subjects for medical experiments. Originally from California, Utley arrived in the Pacific Northwest in the early 1940s, where he completed his civilian public service duties as a cook at Fort Steilacoom’s Western State Hospital for the mentally ill. Here, Utley painted portraits of the hospital’s patients and staff, among other subjects, which allowed him to practice and refine his painting skills, using the war to turn a part-time hobby into a full-time passion and future career. Unlike Vitousek and Utley, Jess D. Cauthorn personally took part in combat action. He was studying as a commercial-art student at Seattle’s Edison Vocational School when he was drafted into the army. Cauthorn “knew little of combat but quite a bit about art…stocking his pack with pencils, charcoal, brushes, watercolors, and sketch paper.”  The army was where his artistic career as an illustrator and watercolor artist began to flourish. During his spare time, Cauthorn produced small watercolor portraits of his comrades, using whatever materials he could find, often mixing his paints with water from his canteen. He was later commissioned to create illustrations of his wartime experiences while in the South Pacific. His depictions include “quiet moments in camp. A line of soldiers on the move…the jungle canopy. Mortar explosions and GIs,” and the liberation of Japanese-occupied Manila. His personal collection of illustrations created during his three years in the army serve as a unique glimpse into the life of an infantryman in the Pacific theater of World War II. He signed each picture with “Sgt. Jess Cauthorn” and used them as his journal from the war, adding text to the larger sketches to describe the scenes he chose to depict. Cauthorn returned from war after three years with the 146th Infantry Regiment and earned a Bronze Star and a Purple Heart. Each of these artists has pieces of the work in the Seattle Art Museum’s permanent collection, none of which indicate their respective histories with the war, but they were all influenced by this major event. Cauthorn and Utley started their art careers during the war, and all three artists continued on to have nationally recognized careers. I find these three stories so compelling because they go beyond the history books to show us what life was like at the time. Windsor Utley’s story is particularly intriguing because he did not go to war. We do not tend to hear about those who stood by their beliefs and fought for peace, while still contributing to the war effort; they are often a passing thought in history because they were not a part of the action. His artwork is also incredible to see. There is no hint of the fact that he was a self-taught artist, someone who only started painting as a hobby. His artwork is not always clear, favoring a non-objective approach that often excludes reality; but that’s just part of the fun for the viewer. For more information about these artists, be sure to search the Seattle Art Museum’s online collections for their biographies. Transcript, Windsor Utley Oral History Interview, March 14, 1985, Laguna Beach, CA, by Barbara Johns, Seattle Art Museum, Northwest Cataloguing Grant, pg. 3. Transcript, Windsor Utley Oral History Interview, March 14, 1985, pg. 2. “Composer of Paintings Windsor Utley dies at 68.” The Seattle Times, 1989. Goodnow, Cecilia. “Through The Eyes of a Soldier,” The Seattle Post-Intelligencer, November 12, 2001. It’s raining again. I stare as rivulets of water course down the window panes of my room, obscuring the view outside. Beyond my window, the passing cars blur together alongside the chairs that decorate my lawn. Everything assumes a greyish cast. “Welcome to Seattle,” people say. Prior to moving to here, I had never encountered a group of people so fixated on the weather, and I’ve lived in Cleveland where it is not only grey but also claims ownership of “The Lake Effect,” which encompasses all manner of atmospheric sins. Yet as I approach my second year of living in Seattle, I too, have become consumed by thoughts of the dreary weather – so consumed by these thoughts that I seem to have neglected my blog – and the ever-present hope that sun is just around the corner. However, it was the weather that inadvertently led me to the exhibition Camera Work: Process & Image held at SAM from November 26, 1985 to February 2, 1986and focused on the early pioneers of photography including Julia Margaret Cameron, Edward Steichen, Clarence H. White, Paul Strand, Alfred Langdon Coburn, and Alfred Stieglitz. 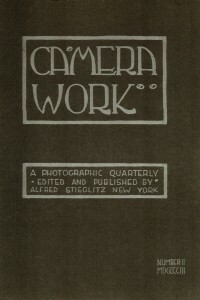 Cover of Camera Work, Issue No 2, April 190, published by Alfred Stieglitz and designed by Edward Steichen. Determined to elevate both photography and the photogravure to the status of fine art, Stieglitz produced a magazine whose primary focus was photography. 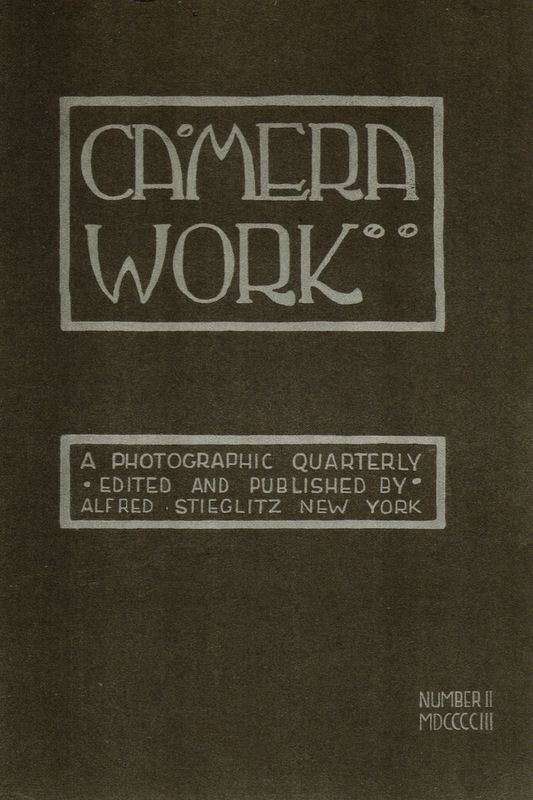 As a member of the New York Camera Club, Stieglitz spearheaded the production of a quarterly journal – called Camera Notes – dedicated to both high quality photography and articles surrounding the art form. Yet Camera Notes was merely the beginning, for in 1902 – a mere five years later – Stieglitz left the Camera Club and started his own quarterly, Camera Work, in which he strove to establish a journal that was in and of itself a work of art. From 1903 to 1917, Stieglitz edited and published a total of fifty editions of Camera Work, through which he championed photography as a form of art instead of a mechanical process that simply documented reality. 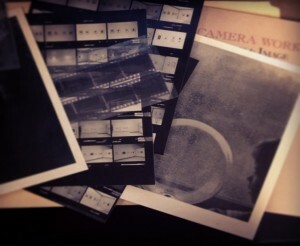 He pushed photographers to take an active role in the editing process of photogravure production – a print of the photographic image that emphasized deep shadows and a rich textural quality – in which the photo negatives are transformed into photo positives and transferred onto a printing plate that is then etched and printed. Stieglitz strove to maintain high quality photogravures that he felt could be viewed as original prints that had their own artistic value. Through this process, photographers in Stieglitz’s circle were able to participate in the production of the photogravures, which instigated a collaboration between the artist’s intent and the hand that created the final product. Exhibition media file – including exhibition installation views and transparencies and prints of checklist images – from Camera Work: Process & Image and the exhibition catalogue. Photo: Kaley Ellis. This examination of Stieglitz’s Camera Work and the photographers involved in that publication act as the focal points of the 1985 exhibition at SAM. Of the works displayed, Clarence H. White’s Drops of Rain, Adolf de Meyer’s Still Life, Hugo Henneberg’s Villa Falconieri, and Alfred Stieglitz’s Spring Showers, New York are the works I find the most compelling. Water is prominently featured in all these works, whether it takes the form of rain, a glass of water, or a shimmering river. The water either distorts and obscures aspects of the work or is itself distorted. Far from being a direct representation of fact, the water provides a medium through which the artistic intent becomes clear. 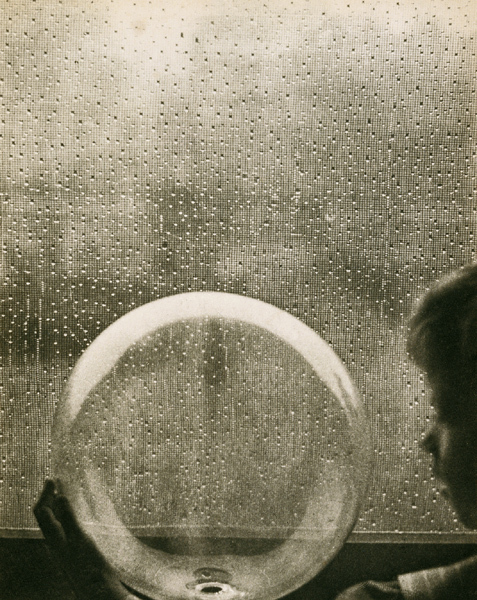 The fact that it is raining outside is not the point of the image in White’s Rain Drops; instead, the simplicity, the lighting, and contrast between the smoothness of the glass ball compared to the pattern of rain drops on the window pane combine to make this work beautifully compelling. The emotional response that these images evoke transcends time and, like other forms of art, is subjective. Today – despite rapid advances in technology and the advent of the digital camera – artists such as Stieglitz, White, and Cameron remain relevant. New lens are engineered, such as the lensbaby, to create a blurring effect or to obscure the background, while plastic cameras allow photographers to further experiment with light and shadows and finally Photoshop and the Instagram app offer the opportunity to enhance or manipulate an image with the click of a button. Despite these developments, photographers are still creating images that favor the deep shadows, blurred lines, and sometimes dreamlike quality that continues to reference the past and the art of Stieglitz’s circle that he tirelessly perfected for publication in Camera Work.